Garages are unique spaces in our homes. They can be used for almost anything. Our garage door installation team has seen garages that are used as storage spaces, workshops, and even man caves complete with bar and big screen television. One thing that most garages have in common, though, is that they aren’t well organized. Garages tend to be a dumping ground for unwanted furniture, random tools, and outdoor gear that quickly piles up. 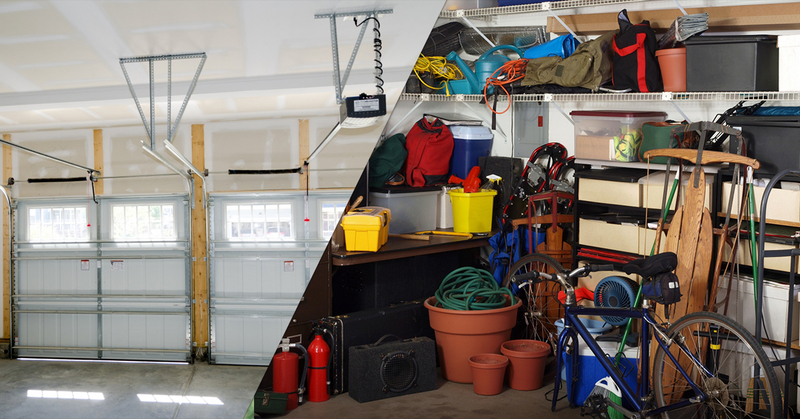 If you are tired of seeing a messy garage and not being able to find the stuff that you want, we have some tips that can help you keep your garage clean and organized. Start by getting rid of trash and unwanted items. Donate them to your local charity shop or take them to the dump. Be ruthless about what you get rid of, because the less stuff you keep the less stuff you’ll need to organize later on. Sweep out your garage. Get all of the leaves and debris out the door and use the broom to remove any cobwebs you come across. Make it a goal to sweep the garage once a month and put a reminder on your calendar or in your phone. Make sure your garage door has a good weather seal at the bottom. That weather seal is used to keep water and leaves out of the garage. If you need to have it replaced, talk to our garage door installation team. Need a new door for your garage to help keep it clean and organized? Talk to our garage door installation team and we’ll help you find the right door and get it installed right away. Invest in metal shelving and large plastic totes. If you have the room, line one wall of your garage with metal shelving that’s large enough to hold large plastic totes with lids. You can use the totes to store camping gear, outdoor toys, seasonal decorations, and other odds and ends. Clearly label the bins so you know where everything goes. Hang up peg board. On another wall, hang up sheets of peg board and purchase pegs and hooks that work with it. This is the perfect place to store tools so you can easily see them and hang them back up when you are done with your project. Use overhead storage space. A lot of garages have overhead space that offers a lot of storage opportunities that might be overlooked. You can hang bikes from the rafters of your garage using special hooks, or put seldom-used items (like Christmas decorations) into the attic space of the garage. This gets it up and out of your way.